Operator inputs to the OCD are transmitted via the Control and Power Distribution Units (CPDU) to the lighting equipment to be controlled. 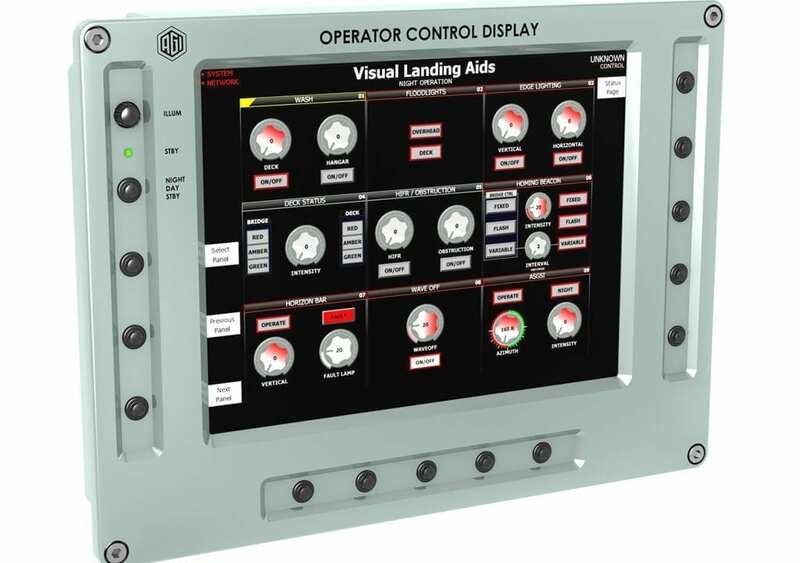 The OCD is a 15” TFT control console operating from the 115 – 230V 50/60Hz ships supply, and with a number of “soft keys” to access on screen menus for the HELIVAS equipment control. The OCD will communicate with the Network Switch via Ethernet messages to effect lighting control. The OCD will meet MIL STD 461E. The CONTROL & POWER DISTRIBUTION UNIT interfaces between the Network Switch and the lighting system units. The CPDU will be available as a low or high power unit, as required, and will be capable of being powered from 90-265 V rms 50/60Hz ships supply. If a fault condition is detected within the CPDU this will be reported to the Network Switch, which in turn will display the information on the OCD. The CPDU channel outputs will be protected by solid state resettable fuses.